Welcome to Western School District! Western School District consists of three elementary schools, one middle school, one high school and one career prep high school. Our three elementary schools are located in separate corners of our school district to best serve our communities. Our middle school and high school are located on our main campus centrally located within the district. Our career prep high school, which provides services to both career and college-bound students, is located on the eastern edge of our school district sharing a border with the community of Jackson. While considered a rural, blue-collar school district, Interstate I-94 and business route M-60 run east and west through the middle of our district, located 5 miles west of Jackson in the heart of southern lower Michigan, which also provides quick and easy access to Interstate 127 running north and south. Panther Country is located only a short distance from the State’s capital of Lansing to the north, Ann Arbor to the east, Toledo to the south, and Kalamazoo to the west. Western schools consistently maintains a student population of nearly 3,000 students, 153 certified teachers and numerous support staff providing services to the students from our local communities of Parma and Spring Arbor, home to Spring Arbor University and, in recent years, awarded the best small town to raise children in Michigan, as well as being a popular “School of Choice” both within Jackson County and contiguous out-county school districts. Western has an award-winning arts program, a highly competitive athletic program, and an exemplary academic program which generates National Merit Scholarship finalists and/or semi-finalists almost annually. Western schools boasts opportunities to meet every student’s needs, where all students can learn and be successful. When you think of schools, you immediately think of students, but we would be remiss if we didn’t acknowledge our staff, parents and community members that consistently support us to provide the best educational opportunities available for our students. We appreciate you taking a look at all Western has to offer. Please feel free to peruse our website, visit our building pages, check out our offerings and contact us with any questions you may have. Western Schools will be accepting Schools of Choice applications for fall openings of the 2019-2020 school year beginning May 15, 2019. 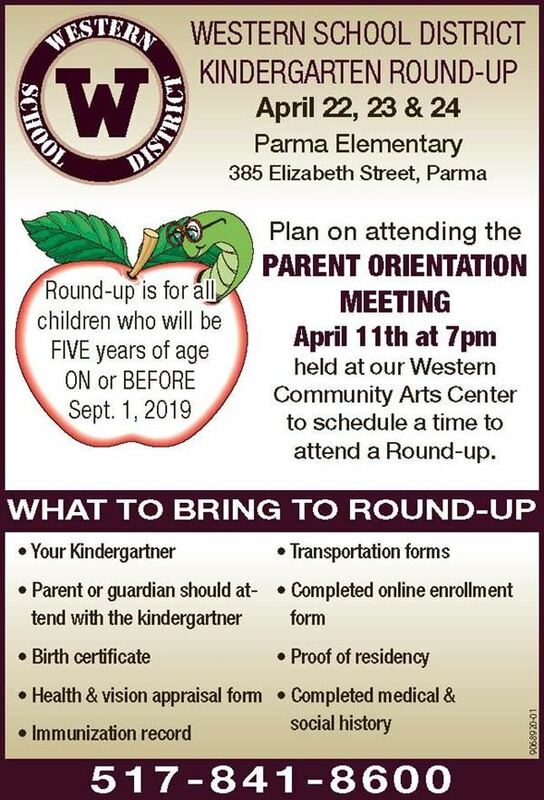 The SOC application form (below) must be completed and returned to the Western School District Administration Office between the dates of May 15, 2019 and June 15, 2019. Applications received after June 15, 2019 will be placed on a waiting list for fall placement consideration, if space remains available. IMPORTANT: The application form must be dated within the application window, May 15, 2019 - June 15, 2019, and the center section of the application must be completed and signed by an official of the school that the student is currently attending in order to be considered for Schools of Choice. GRADE LEVEL OPENINGS: Western has limited SOC openings for fall 2019-2020. The number of available openings will be posted when they become available. Work Sessions of the Board of Education will be conducted on the second Monday of each month beginning at 5:30 p.m. The fourth Monday of each month will be the regular monthly board meeting night beginning at 6:30 p.m. Both meetings are held in the Conference Room of the Administration Office Building. There may be deviations to this schedule from time-to-time so watch our Calendar of Upcoming Events for the most up-to-date information.